Dr Madan Lal Madhu left behind a rich legacy that has inspired generations of Indians. 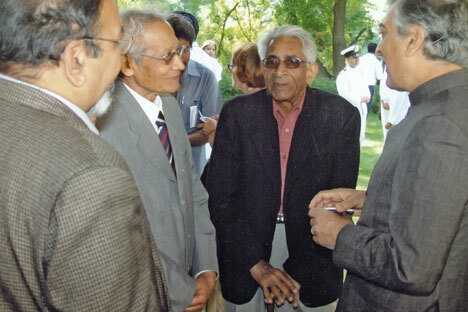 The Indian community in Russia and the activists of India-Russia friendship suffered an irreparable loss with the sad demise of Dr Madan Lal Madhu, 88, on July 7 in a Moscow hospital. He came to the Soviet Union in 1957 to work in Moscow as a translator of Russian literature into Hindi under an agreement between Jawaharlal Nehru and Nikita Khrushchev. Over 57 years, Dr Madhu himself a poet, translated the masterpieces of Russian literature beginning from the immortal poetry of Alexander Pushkin to Leo Tolstoy's 'War and Peace' into Hindi allowing millions of Indian readers to feel the soul of the people of distant and unknown Russia. Until the publication of the works of great Russian writers like Ivan Turgenev and Anton Chekhov in Hindi, most of the Indians read them in English and thought them to be British writers. In the beginning of his career as translator in Moscow, when he was required to translate the works of the Russian classics and contemporary writers in Hindi from already available English translations, Dr Madhu felt that something was missing in them and he started learning the Russian language so that he could directly translate from the original work. Perhaps this was one of the reasons why his translations were so lucid, as if originally written in Hindi. Once young students asked him the secret of his success, Dr Madhu said: I do not translate words, I convey the feelings expressed by the writer. Dr Madhu's translations of Russian literature also played a decisive role in nurturing love for Russia in me and people of my generation who were fascinated by Sputniks and Yuri Gagarin. I remember visiting a fair with my father when I was about eight years old. We went to a stall selling books published in the Soviet Union. I picked up a beautifully illustrated book in Hindi. I still remember its name: Uphaar (a Gift). When going through it in one go, I came across the name of its translator: Madan Lal Madhu. Since then I read a lot of beautiful Russian books translated by Dr Madhu and after finishing my school I decided to join the newly opened Institute of Russian Studies in New Delhi, which is now part of the Jawaharlal Nehru University. I had the privilege of seeing Dr Madhu at the Gandhi Jayanti function in October 1968 at the Peoples Friendship University in Moscow, just a little over a month after my arrival for higher studies in Soviet Union with a group of five students from the Institute of Russian Studies. He had recited his poem at the function. However, we were unable to get closer to him and greet him personally. Much later in 1972, I had the honour of shaking hands with Dr Madhu at the Republic Day function hosted by the Indian ambassador. After many years I had the privilege to work with Dr Madhu over the translation of Tolstoy's 'War and Peace' novel. He was completing the translation, but due to publisher's deadline, he needed someone to translate the epilogue of the novel. I was afraid to take up the job, but he encouraged me and assured that I could always rely on him. We got closer during this work and since then he would always phone me to enquire my well being. This was another facet of his talented personality. It was Dr Madhu, who more than five decades ago founded the Hindustani Samaj in Moscow to unite the families of the Indian staff employed at foreign service of Radio Moscow and various publishing houses translating books in Hindi and other Indian languages. Except for a very brief period, most of the times he was the president of Hindustani Samaj and thought it was his personal duty to care for the welfare of each and every Indian in Russia. In the last days of the USSR, with the diversification of the Indian community, Dr Madhu did a lot to bring the Indians employed in the private business companies and press persons into the fold of Hindustani Samaj. After the Soviet collapse and growth of the Indian community, various cultural groups and societies representing the rich heritage of Indian states were created in Moscow, however, thanks to Dr Madhu's able guidance they remained attached to Hindustani Samaj. The governments of Russia and India honoured Dr Madhu with the 'Friendship Order' and 'Padma Shri' for his personal contribution in cementing India-Russia friendship. Fifty seven years ago, the arrival of the first team of Indian translators in Moscow for translating Russian literature into Hindi and other Indian languages was a game changer in boosting bilateral relations at the people to people level. Several generations of Indians and Russians have grown up in the spirit of brotherhood. Dr Madhu did his doctorate in the comparative study of the works of great Indian writer Premchand and Russian literary giant Maxim Gorky to prove that in spite of huge distance and cultural diversity the people of India and Russia share common values and have a common heartbeat. Dr Madan Lal Madhu has already left behind him a rich legacy, which had inspired generations of the Indians. The best tribute to him would be to reprint his translations in India and make them available to the general public at affordable price. It would also be a major contribution in promoting people to people ties for the benefit of younger generations.